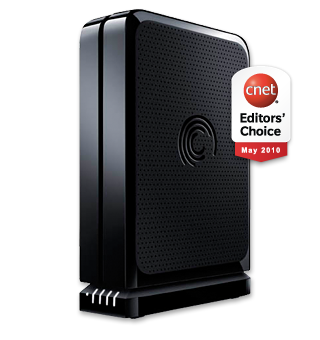 The Seagate FreeAgent GoFlex external hard drives allow for multiple connection types and use with both a Mac and PC interchangeably - going back and forth between the two - without reformatting the drive. Seagate's new FreeAgent GoFlex external drive hard drive allows you to store data from a PC and Mac interchangeably onto one single drive. The flexibility doesn't stop there as Seagate offers optional cable adapters for connecting via USB 3.0 and FireWire 800 cable connections. A USB 2.0 cable adapter cradle and cable are included, which displays the integrated capacity meter as well. You may choose the optional adapters to upgrade your drive to a faster speed or for more versatility. As if Mac/PC interchangeability and connection flexibility weren't enough, Seagate includes an Automatic Continuous Backup software that backs up your files real-time as you change them. No more scheduled backup times needed, just use the easy Seagate Dashboard to manage backup options and view statistics! Note: Reformatting to HFS+ required to use backup software for Mac or Time Machine software. The FreeAgent GoFlex Desk (for desktop computers) comes in 1TB, 2TB and 3TB capacities.